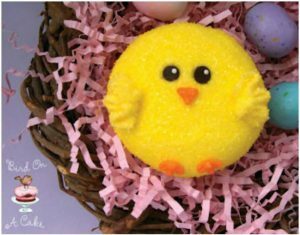 These little chick cupcakes are almost too adorable to eat – but they’re also delicious so eat away! You just make regular cupcakes and then dip in yellow sanding sugar. Then add chocolate chips for eyes and pipe on the rest of the face and wings. They’re really easy and will instantly become a family favorite. They’re also great for Easter parties at school. 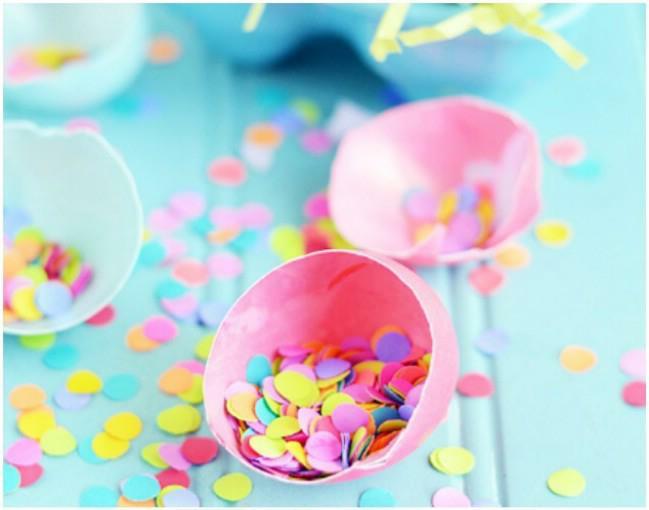 Confetti eggs are fun for the entire family. You use real eggs, which you empty – and this is a delicate but really easy step. Then dye your eggs and fill them with confetti. Finally, you cover the whole with a piece of tissue paper and let it dry. Only you will know that these aren’t really hard boiled and decorated Easter eggs and it will be so much fun watching people crack and open them with the confetti falling out. Little ones are going to be so excited to plant their magical jelly beans and see what grows. This is a wonderful tradition for families and all you have to do is “plant” jelly beans in your garden or yard. Come back a while later to see which ones have bloomed – in the meantime, you’re going to stick a treat in the ground and let the kids know that these grew from their magical jelly beans. 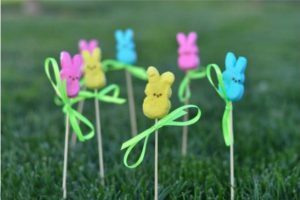 You can buy Easter trees and decorations at the Dollar Store for just a few dollars, or make one yourself. Just find a branch, paint it white – or pink if you prefer – and then add decorations. 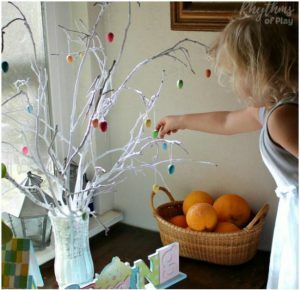 You can even DIY your decorations, and kids are going to love helping to decorate the tree. 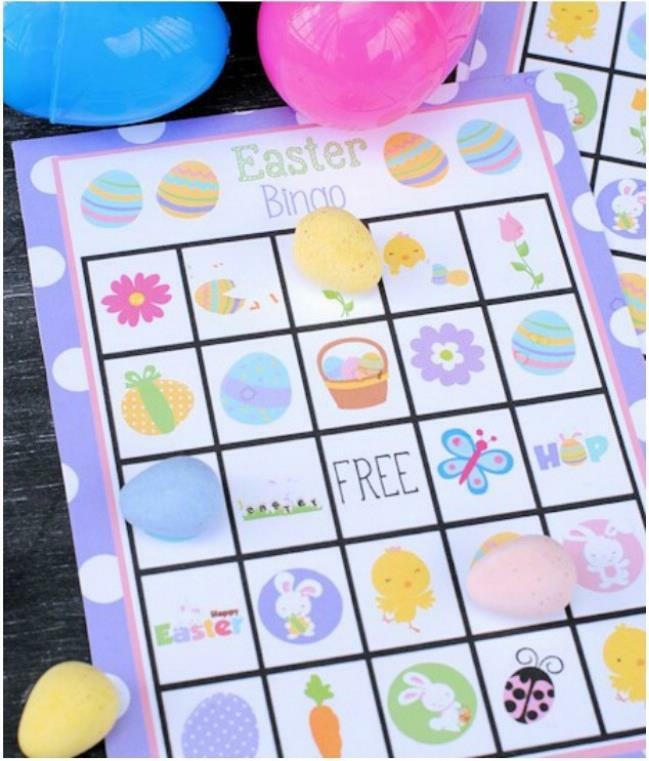 This is a really fun Easter game that kids of all ages are sure to love playing. Print off the game board and then use jelly beans or robin eggs to play. 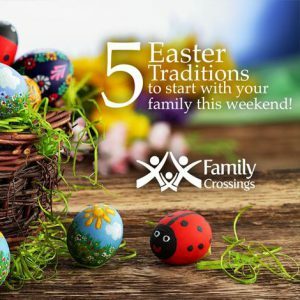 It’s so much fun and a wonderful way for little ones to wear themselves out the night before Easter so they’ll go to bed early.